The pace at which technology is evolving today makes the digital sector a highly coveted one to work for. According to the latest statistics in Europe, however, the share of men working in the digital sector is 3.1 times greater than the share of women. 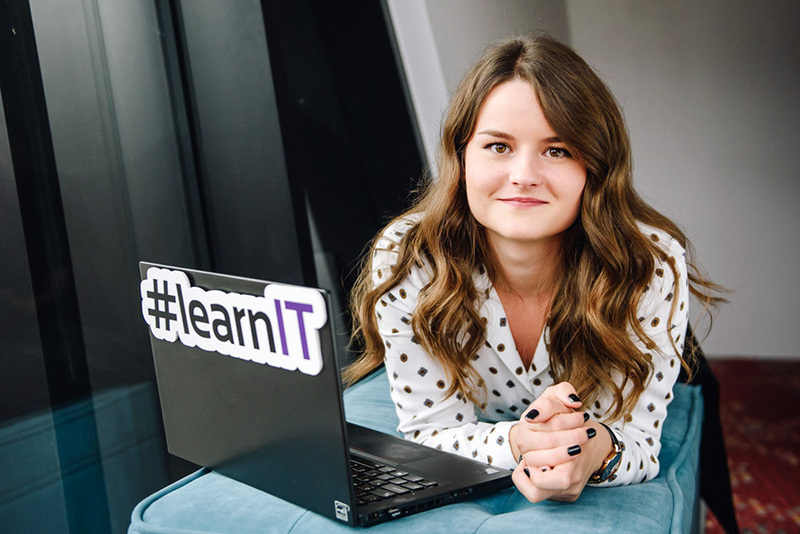 UN Volunteers in Bosnia and Herzegovina are determined to put an end to this imbalance through the project IT Girls, an IT skill-building initiative for women and girls. Ena Kosanović, a United Nations Volunteer serving with UNDP in Bosnia and Herzegovina and working on the IT Girls initiative. The initiative started in 2016 with a training workshop on the basics of website development for girls aged 13-15 years old in Sarajevo. Later, the project spread to other parts of the region, backed by the hard work of volunteers and students from the Faculty of Electrical Engineering and International University in Sarajevo who helped the young girls to explore coding. Ena Kosanović, UN Volunteer with UNDP, has a long history of volunteering since 2006, when she was just in primary school. Since 2016, she has been particularly proud of her contribution towards creating gender equality in her home country, Bosnia and Herzegovina, through IT Girls. Armina Fazlić is another UN Volunteer who works with UNDP as Administrative Support Assistant for the Flood Recovery Programme, which helps the most vulnerable population affected by floods in the country. She is also a part of the IT Girls skill-building initiative and has found this experience of organizing the trainings both rewarding and eye-opening. In the present day, on the advice of Maja Hadziselimovic, a robotics engineer and Ambassador of EU Robotics Week, the initiative is focusing on building skills in Arduino, an open-source platform that drives innovations related to the Internet of Things. As well as being relevant and easy to learn, Arduino makes classes fun and interactive. With that in mind, IT Girls moved online to seek crowdfunding to organize 6 Arduino workshops in at least 6 different schools for 120 girls. The crowdfunding has been a success, garnering 150% of the required funding assistance to spark the tech dreams of young girls in the region. The appeal for funding continues to reach the next milestone and create greater impact. For Nela Sladojevic, UN Volunteer with UNICEF and IT Girls, this project is nothing short of a digital revolution. As someone who has been engaged in helping young people to reach their full potential for over 15 years, she has an interesting personal story of success from UNLEASH Lab 2017, a global innovation lab focusing on the UN’s Sustainable Development Goals.